This is one of my favorite raw vegan desserts – no dairy, no gluten, no refined sugar AND no baking. I initially made these as a snack to eat at the beach as they are easy to pack, carry and share. My dear friend fell in love with these heavenly balls and has been texting me ever since about how much she enjoys my chocolate balls. She eats them for breakfast, lunch, snack AND dinner. I do too. 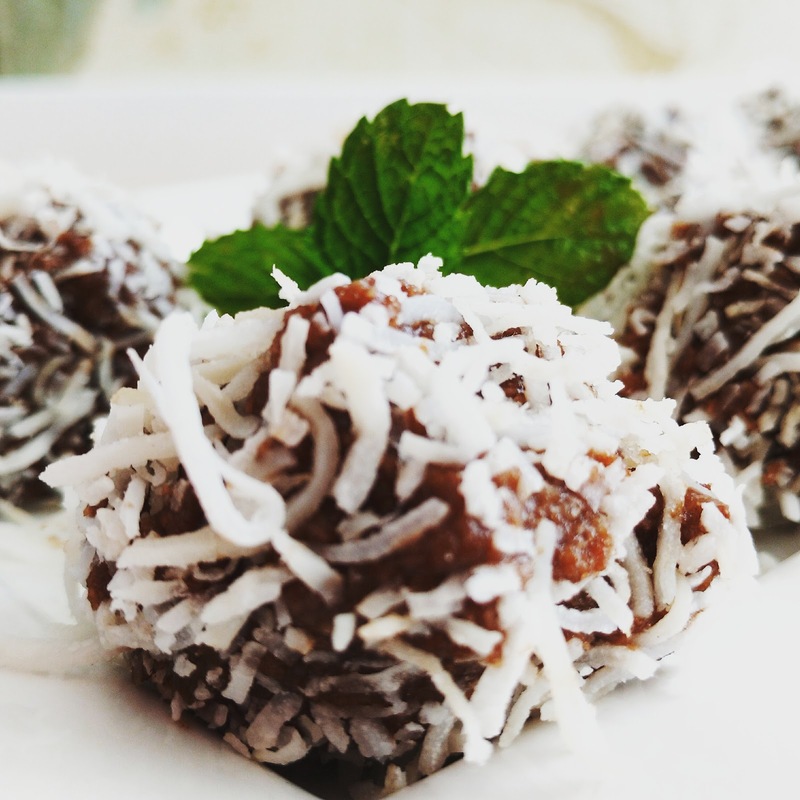 I love these Chocolate Coconut Beach Balls because they are simple to make and made from real foods – nuts, dates, cocoa, coconut, coconut oil, coconut milk, maple syrup, and vanilla. It all started with a recipe for Almond Joy Protein Balls from iFoodreal.com. Howeer, I can’t eat almonds, don’t use protein powder (either whey or plant-based) or stevia extract. So, I ended up with a soggy mess in my food processor. I figured that I had botched the whole recipe but, being the persistent type, I added a few ingredients and turned it around. The end result was a surprisingly soft, buttery, mildly sweet, chocolaty dough – very much like a chocolate truffle that just melts in your mouth. So whether you like them big or small, take 5 minutes to make them and indulge! 1. In a food processor, add nuts, cocoa powder, salt and process until a fine powder forms. 2. In a bowl, stir together coconut oil, honey, coconut milk, vanilla and add to the food processor. Process until all blended. 3. Add dates and process on the highest speed. 4. Add coconut a half cup at a time and continue to process until a smooth dough forms. You may need to add more dates and/or more coconut to get it to the right consistency. 5. Place some coconuts flakes on a plate, scoop a ball (the size of your choosing) with a spoon, roll with your hands into a ball and coat in the flakes. You could also put some shredded coconut in a plastic bag and shake it to coat each ball. 6. Refrigerate for 30 minutes to firm the balls up. 7. Refrigerate in a n airtight container for up to 2 weeks. They taste great both chilled or at room temperature.